Networked digital signage has come of age. 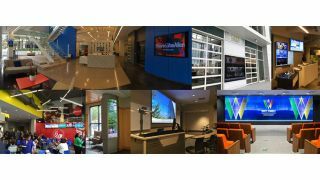 (Left to right) Projects from Visix Inc.: Charlotte Chamber of Commerce, Terminus Atlanta Cousins Properties, Georgia State University information desk, Georgia State University’s Piedmont central dining, Virginia Commonwealth University, University of Idaho (photo courtesy of LG), Clemson University Watt Family Innovation Center (photo Courtesy of Leyard and Planar). New display technologies combined with more sophisticated content delivery and management systems are delivering smarter experiences by using gathered data. “We see a number of recurring trends in the networked campus environment associated with new display technologies and data-driven content,” said Sean M. Matthews, President & CEO of Visix. When choosing a display for a particular installation, all factors need to be considered. “If you’re picking a display that will be secured outdoors at a restaurant, what capabilities are essential?” asked Ron Gazzola, senior vice president of Sales & Marketing IT B2B, at Samsung Electronics America. “You will need a solution with high brightness, perfect for great visibility outdoors in a drive-through,” he said. You will need an enclosure that makes the signage graffiti-proof and weather-proof so it is able withstand any harsh environment. “It’s also important that it has heating and cooling abilities for ever-changing outdoor temperatures.” In this scenario, the Samsung OH series offers customized solutions and remote content management enable through its SMART Signage Platform (SSP), and partner ecosystem. “In addition, these displays can also be serviced easily so there is not a lot of down time when they need to be tended to,” he noted. There are enough failed digital signage deployments with dark screens to support Merollo’s case. “Content dictates which hardware you will use, as well as the environment it’s placed in, its orientation and the placement. Any time you are looking at a network campus deployment, I suggest that you first run a test trial in different areas of the campus to see which products work best and in which configuration for different areas,” she explained. “You also need to think about creating a scalable solution.” Sharp’s PN-Y Series professional LCD displays are a affordable, scalable and versatile. “While one solution might work well in the short term, it might be necessary to add additional features to it, such as an RSS feed or images and videos,” she said. “The focus on changing lobbies with these solutions are increasing opportunities for enhancing the brand, and for new ways to create impressions,” said Rich Ventura, vice president, Business Strategy at NEC Display. Ultimately it is all about connectivity, creation, and dissemination of information, Premier Mounts’ Dozier added. “The objective is to provide useful data wherever you are, whenever you want it, and on any display device. The quality of the content and how seamless we make the interface will determine how much it is used and to what degree of success.” In the final analysis, no matter the venue digital signage “becomes a canvas to communicate messages to thousands of unique visitors each and every day," she said.